This Healthy Homemade Granola is delicious and incredibly easy to prepare. It’s made with simple everyday ingredients and naturally sweetened with maple syrup. Have you ever made your own granola? It’s ridiculous how easy it is and how much better it tastes than the store bought kind. It’s also much better for you – store bought granola is notorious for being loaded with sugar. I remember years ago I was addicted to a certain granola brand and would eat it EVERY morning. Months later I finally checked the nutrition label… and let’s just say I was having about 25 grams of sugar in every bowl – oops! 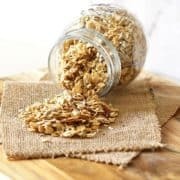 This Healthy Homemade Granola is naturally sweetened with a couple of tablespoons of maple syrup, which can easily be subbed for honey or rice malt syrup if you’d prefer. And it only takes 20 minutes to throw together. I love sprinkling this healthy granola on top of some greek yoghurt or a smoothie bowl, but it’s also great on its own with some milk. 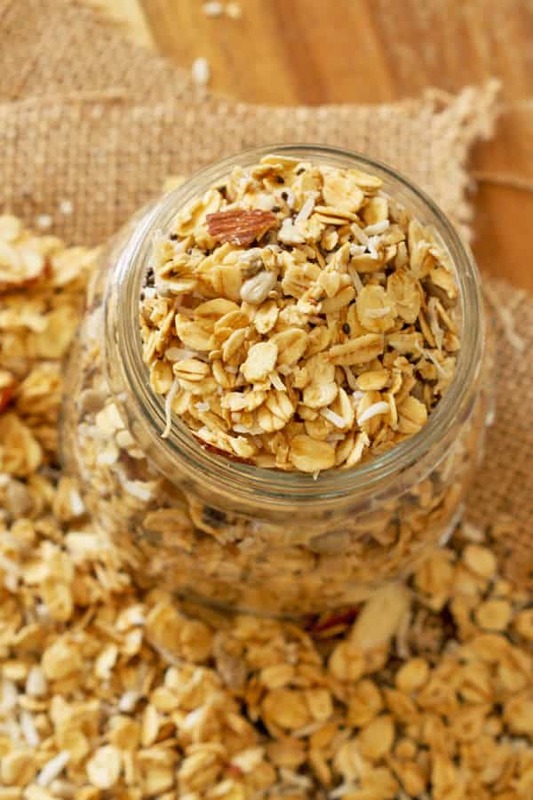 Traditional Rolled Oats – Also known as old-fashioned oats. Almonds – OR you could use your favourite nut instead. Maple Syrup – OR you could use honey or rice malt / brown rice syrup instead. Shredded Coconut – OR you could use coconut flakes instead. First, preheat the oven to 150C/300F. Then mix all ingredients together aside from the coconut in a large bowl. Use your hands – sure it’s sticky & a little messy but it gets the job done (photos 1-2). Cover a tray with baking paper and spread mixture into a thin layer on top (photo 3). Bake for 10 minutes, then take the tray out of the oven and sprinkle some shredded coconut on top. Pop the tray back into the oven to bake for another 5 minutes (photo 4). 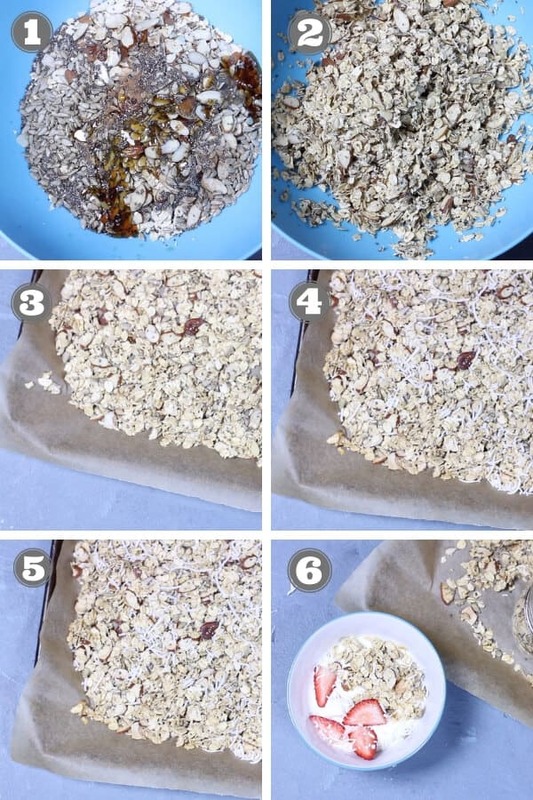 Take the tray out of the oven and leave the granola on the tray to cool fully before using (photos 5-6). Allow the granola to cool fully, then pop in an airtight glass jar or container and store at room temperature for up to 2 weeks. You can also freeze granola – just pop the jar or container in the freezer and store for a few months. When you are ready to use just leave the jar on the bench overnight to defrost. Be careful not to burn the granola. The oats brown really fast, so keep an eye on it as it cook. 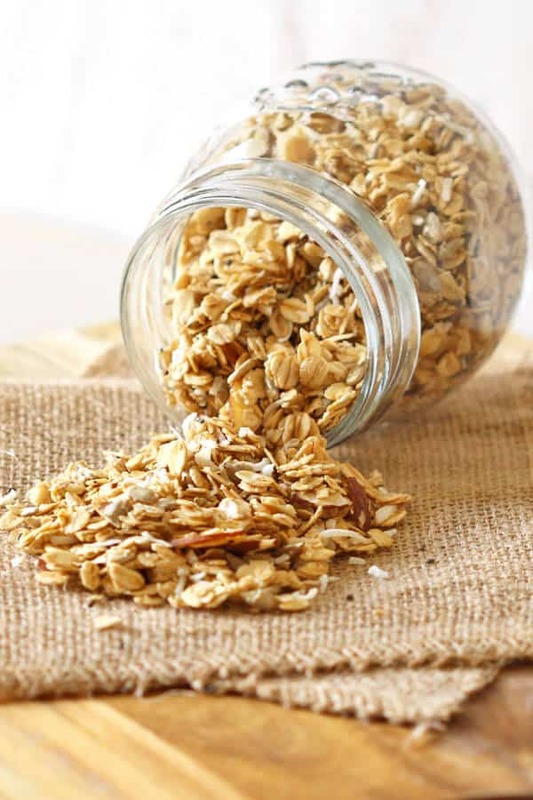 Be sure to use traditional rolled oats, or old-fashioned oats as they are also known. Quick oats or steel cut don’t work in this recipe. Play around with your own variations with your favourite nuts and sweetener. If you’ve tried this Healthy Homemade Granola I’d love to hear how you enjoyed it! Pop a comment and a star rating below! 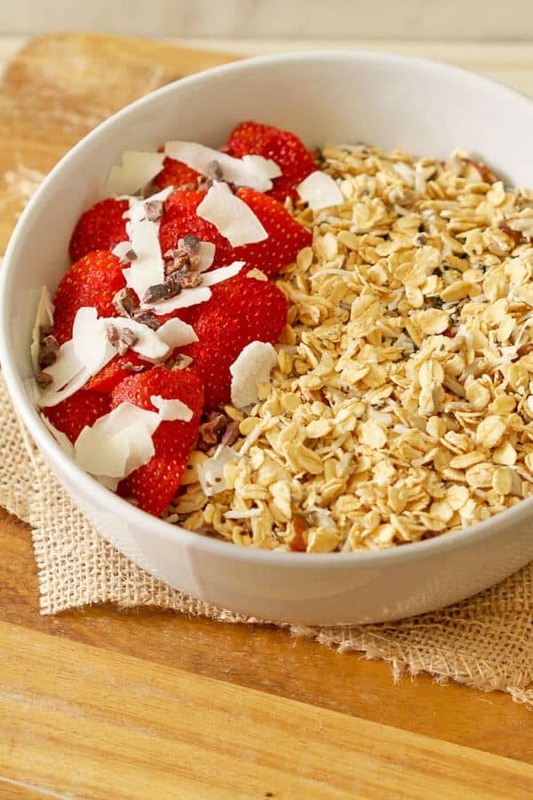 This Healthy Homemade Granola is delicious and incredibly easy to prepare. It's made with simple everyday ingredients and naturally sweetened with maple syrup. Mix all ingredients together aside from the coconut in a large bowl. Use your hands - sure it's sticky & a little messy but it gets the job done! Cover a tray with baking paper and spread mixture into a thin layer on top. Bake for 10 minutes, then sprinkle the coconut on top and bake for another 5 minutes. Take out of the oven and leave on tray to cool fully before using. Traditional Rolled Oats - Also known as old-fashioned oats. Almonds - You could use your favourite nut instead. Maple Syrup - You could use honey or rice malt / brown rice syrup instead. Shredded Coconut - You could use coconut flakes instead. Store in airtight jar or container for up to 2 weeks (if it lasts that long!). You can also freeze granola in the airtight jar or container for a few months. When you're ready to use it, leave it on the counter overnight to defrost. First Published February 5, 2018. Last Updated March 20, 2019 – no changes to the recipe, just updated with more photos, tips and tricks. Adding in some dried raisins and cranberries sounds amazing!